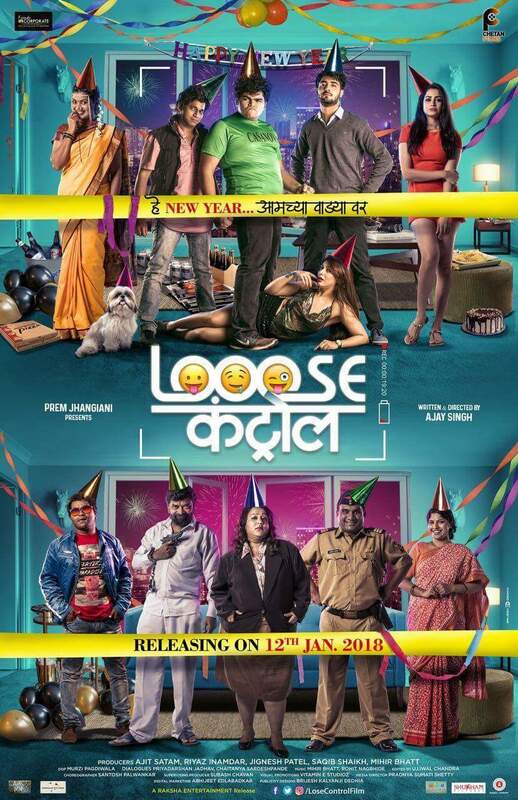 "Looose Control (लूज कंट्रो)" is an upcoming marathi movie all set to release next year with a bang on 12th January 2018, It is a the story of the three friends learning engineering and their everyday life, written and directed by Ajay Singh and produced by Ajit Satam, Riyaz Inamdar, Jignesh Patel, Saqib Shaikh and Mihir Bhatt and presented by Prem Jhangiani. The film's first look poster was released recently on social media, the poster reveals artist partying hard and celebrating the new year. The film has a huge star cast and nice balance of budding and experienced actors like Madhura Naik, Akshay Mhatre, Manmeet Pem, Shashikant Kerkar, Kushal Badrike, Shashank Shende, Bhau Kadam, Aarti Solanki, Tia Atharva, Binod Rai Bantawa, Bunty Chopra, Namrata Awate, Prajakta Hanamghar, Namrata Kadam, Ajay Purkar, Rama Nadgowda, Deepika Sonawane, Anjali Atre, Pooja Keskar, Anjali Dharu, Vikas Waghmare, Umesh Jagtap and Praveen Khandve.